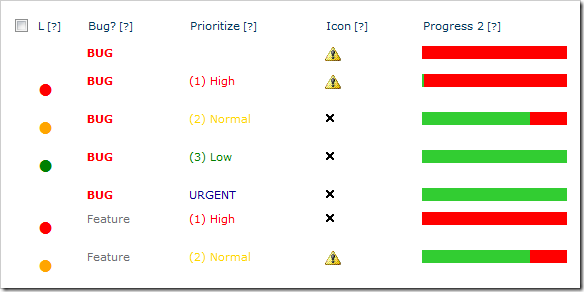 Complete guide to filtering SharePoint lists by the current week. A common requirement in SharePoint is to filter lists so you’re only showing the current week, month, quarter etc. If you only want to see the last X number of days (e.g. last 30 days) then it’s simple enough. If you want setup a SharePoint view to see the current calendar week then its a little more complex – especially if you define your week differently from the standard Sunday to Saturday or Monday to Sunday. First you must look at and really understand the method for setting up SharePoint views to filter the current calendar month or week as it’s not really obvious. Setup a View Filter showing items when [Today] is in that range. Again – see this post for showing the method in step-by-step detail. See this picture for some test data, its in a strange order (Thursday to Wednesday if first) but check it out on your desk calendar if you’re not convinced! I spent a long time working on SharePoint Highlighter, and then later unsuccessfully trying to make a [Today] Calculated Column. During both these projects we kept coming back to this glaring hole in SharePoint: You can’t use HTML in a calculated column. So when it came to deciding what I wanted to do in my 10% time, the answer was clear. Having listened to me rant, rave, swear, and finally give up and denounce all Custom Field Type development (at least once a week during Highlighter, and several times during the [Today] incident), Ryan’s reaction to my choice of project was a typically understated “I’m… surprised?”. How is this different to Christophe’s solution? Adding the CEWPs can be a bit of a chore in some cases, and are vulnerable to being accidentally broken by end users editing the pages. They can also be lost on 2007 to 2010 upgrades. However, HTMLCC requires that a System Administrator install it on the SharePoint server; which in many organisations is a real pain in the ears. Whereas Christophe’s solution can be implemented by most power users. Isn’t this the same as Highlighter? Most notably, all of this is offered through a polished and intuitive interface. So, you get to plug the hole in SharePoint that’s bothered so many people over so much time, and we get to plug SharePoint Highlighter whenever we mention it. Everybody’s happy. After developing SharePoint Highlighter, we seriously considered expanding on this area with a Calculated Column that would allow you to use [Today] in the formula. If you’re thinking “But you can already!” I suggest looking at Ryan’s article about the [Today] column trick. Needless to say, this would be a very useful tool for almost any SharePoint user. After much researching and prototyping we came to an unfortunate conclusion: Although it was possible to make a Custom Field Type to do this, it was almost certainly impractical (certainly for us). Brick wall: A completely impassable system limitation. Overgrown with brambles: Nothing but pain for all involved. Swamps: A long unpleasant slog, with an uncertain outcome. The first thought in any developer’s mind when making a variation on a class should be “Inherit it”. It allows you to take advantage of the existing class’ methods with minimal difficulty and yet offers (almost) total control over its behaviour. Windows SharePoint Services 3.0 does not support inheriting from this class. And so this avenue ended in a brick wall. More worryingly; disallowing the inheritance of a class is usually a sign that something so heinous is happening inside that Microsoft doesn’t want it reproduced. Intrigued by the promise of horrifying creatures dwelling within, I had a look inside the class to see what was happening (using my own powers of code intuition, and not any kind of questionable reverse engineering method). It seems the actual calculations take place outside of the SPFieldCalculated class, using instead a call to SPRequest. This new lane of research quickly ended in spiky brambles, as using a direct call to SPRequest would make our product (and hence anything it’s installed on) unsupported by Microsoft. Undeterred, I took inspiration from the billing system at my old work and looked at keeping the ‘black box of calculation mystery’ class running in the background, with the new class acting as a wrapper around it. Creating a Custom Field Type that kept a hidden field for data storage in the background was an architecture we’d experimented with when creating Highlighter, so adding a relatively minor call to update the formula with the current date and time seemed quite easy. The thorny ending in this case was the enormous potential server load; updating the formula every time the list was viewed (to keep it up to date) caused the entire list’s worth of calculations to be refreshed. Viewing just 20 items would make up to 5000 items recalculate their values for each of our columns on the view. The final and most desperate option was to do it ourselves: Completely rewrite all or a subset of the calculated column functions, and handle the associated function nesting. I’m DIM: Doin’ It M’self. 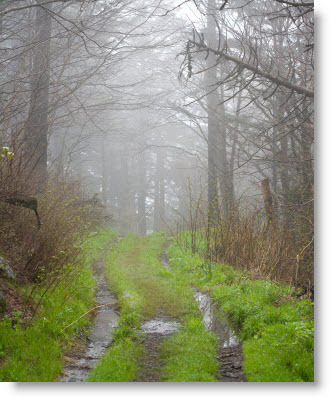 Following this path would mean wading through the boggy and unpleasant process of exactly reproducing Microsoft’s function calls; avoiding the murky bottomless pools of performance issues. All the while hoping we wouldn’t run into any of the hungry and sharp-toothed show stoppers along the way. As you may have guessed, we didn’t venture down this path. Because although these paths aren’t available to us as an ISV, it doesn’t mean they aren’t options to you (except the brick wall, of course). Brambles: Using SPRequest is unsupported, but if this doesn’t deter you then this is still very much an option. Similarly, if you have an abundance of processing power (or really need a space heater in your server room) performing complete column recalculations on every view shouldn’t bother you. Swamps: If you have very specific requirements you could get away with only recoding a few functions, which would greatly reduce the chances of you disappearing forever. Alternatively, if you have a large herd of idle developers you could set about recreating the whole set. However, I doubt this is a serious option for anyone except the head of the Microsoft Silverlight team. 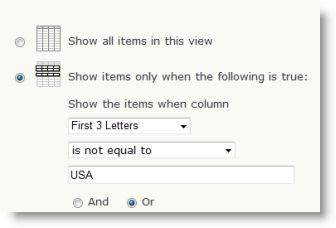 Calculated columns are a really useful feature of any SharePoint list. Whether you want to automatically show the profit on a sale, or the financial year that a date falls in to, or tidy up sloppy user input by capitalising names. There is a lot you can do it with a Calculated Column. But remembering the formulas and functions needed is not always easy, especially before the first coffee of the morning. I know there is a way to get rid of the decimal places on a number but is it TRUN, or TRUNC, or TRUNK – oh no, hang on, that last one is just to do with elephants! So, over the years we’ve gathered together a quick reference of some of the most commonly used functions and formulas – stuck on a wall above the desk it saves a lot of time and head scratching. We’ve found ourselves sending it to clients from time to time, and they seem to find it quite handy too. So we decided to tidy it up – clean off the coffee stains and make a nice PDF of it – and make it available to download, free – yes that’s right, FREE! 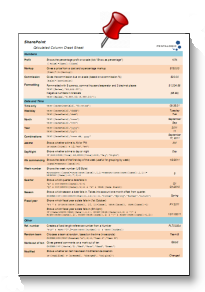 So why not download our free Calculated Column Cheat Sheet and save yourself some time and headaches? This easy 3 page reference sheet gives you a selection of commonly used calculated column formulas, along with a pretty thorough reference of most of the functions and operators you are likely to need in your day to day work. Download, print, stick it on the wall, and we hope you find it as handy as we do! Despite the infamous “fake today column trick” still appearing in new blog posts on a monthly basis you can’t use Today in calculated columns in SharePoint. I’ve seen people assume (not unreasonably) that the same rule must apply with calculated default values used in columns that are not calculated columns as well – but strangely, you actually can use Today in calculated default values, so I am going to explain why it works and how you might use this. What is the difference between Calculated Column and Calculated Default value? 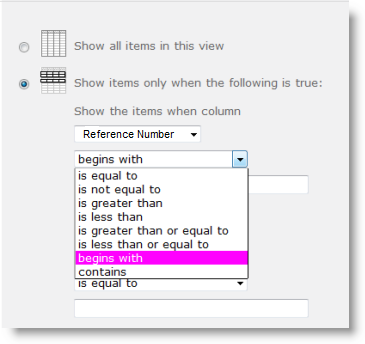 A calculated column, erm… calculates values from other columns in your list. For example if you have an orders list with a Quantity and Price column you can calculate a Grand Total of Price * Quantity. 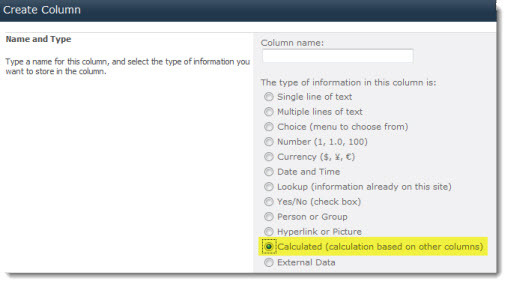 With a calculated default value you use a calculation to set the default value for a column that is not a calculated column – this is the value that is entered automatically when a new list item is created and may be over-written by the user. So why may I want a calculation using Today as the default value? But the user can override that if necessary (public holiday etc). So why can I use Today here but not in calculated columns? With a calculated column the calculation is only reworked every time a record is updated. When it’s just viewed then it picks up the saved result from the last edit. This makes perfect sense for most calculated values, but not for values using Today or Me. If we added the complaint on Monday then it would show that we have 3 days left to do it (Thursday). If we just look at the record on the Wednesday it would still show 3 days (as this was the calculation saved on Monday) when in fact we only have 1 day left to keep the customer happy. That’s why SharePoint wont let you use Today in calculated columns. However with a default calculated value the result is only worked out once when the record is being created – it’s understood that what is saved in this field is not updated automatically so there is no problem with using Today. 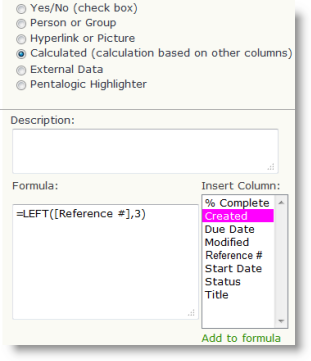 For a bonus point – you can’t reference other fields in calculations for default values (e.g. Start Date or Order Date) as before a record is being created the fields don’t yet contain values. What else could I do with this? The OP in this thread is using it to set default financial years. Suppose that your company’s financial year starts in April then you could use this formula to default to 2009/10 or 2010/11 on or after April. It’s also worth noting that you can use a similar formula in calculated columns – suppose you have an Order Date field and the financial year depends upon when the order was placed then simply replace Today with Order Date. NB – This has been tested with SharePoint 2007/2010.